THESE sorts of Joe Ingles games are become somewhat of a trend. The Australian wing finished with an efficient 27 points - tying his career-high - to go with five rebounds and seven assists, leading the way for his Utah Jazz in a big 123-115 win over the Boston Celtics. 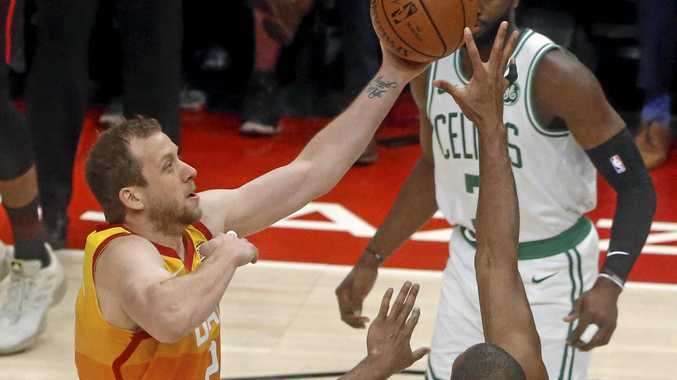 In what was Gordon Hayward's first game in front of his former home crowd, Ingles stole the show, putting on an impressive first-half shooting display highlighted by back-to-back-to-back three-pointers to end the second quarter. Ingles had 20 points heading into the main break, before quieting down as the game progressed. He finished the game shooting 10 of 14 from the field, including five of nine from downtown. Rudy Gobert was dominant on both ends for the Jazz, finishing with 17 points and 15 rebounds, while Ricky Rubio posted 17 points and seven rebounds of his own. The result moved Utah coach Quin Snyder's team to 6-6 for the season. With no Kyrie Irving (personal reasons), Terry Rozier started at the point for the Celtics, posting 22 points, while Jayson Tatum had 21 points for the road team. Australia's Aron Baynes posted five points and two rebounds for the Celtics. Compatriot Dante Exum came off the bench for the Jazz, posting one rebound and one assist in just three minutes of action.